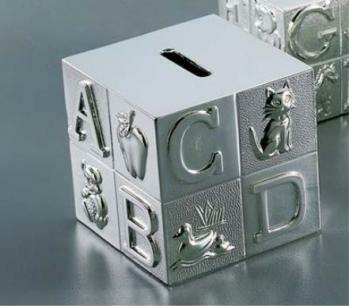 Our ABC Block Baby Bank is a traditional keepsake gift featuring raised alphabet letters with corresponding animals or icons. Letters A thru H are shown on the bank along with the following animals - A - Apple, B - Bear, C - Cat, D - Duck, E - Elephant, F - Fish, G - Giraffe, H - Horse. This bank is produced in a non-tarnish bright nickel plated finish. The coin slot is located on the top of the bank and there is an engraving (optional) area of 1.25" x 3" on each side of the coin slot. Overall dimensions are 3" square. Silver gift box.